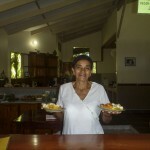 Vikki has worked at La Ponderosa since 2003. 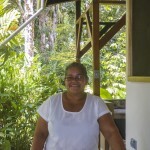 She moved to Pavones from Northern Costa Rica as a young woman. In Pavones she has raised six outstanding sons. You will most often see her preparing breakfast but she also keeps busy in the afternoon with laundry and maid service. Victoria is a kind woman who stays calm under pressure and has an ardent attention to details. Amada began working at La Ponderosa in 2007. She was born in Pavones at her parent’s home not far from La Ponderosa. She has three lovely daughters. She arrives mid-day to fill lunch orders and prep dinner. She also assists Victoria with the maid service and laundry. She has a generous smile, sharp memory and is quick to help with any chore. 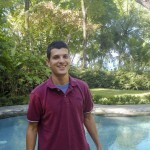 Gerardo has been with La Ponderosa since 2009. He was raised in Pavones along with 3 brothers and 3 sisters. He has one son. Gerardo starts with meticulous maintenance of the pool and patio areas then with keen attention to detail he fills his day with a whole variety of chores that keep La Ponderosa looking its best and running smoothly. 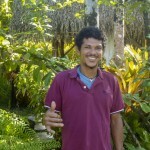 William started work full time at La Ponderosa in 2013. He was also raised in Pavones as one of seven children. He is now raising two adorable daughters. He is kind to nature and has a gift for working in the gardens. Also he is observant and a quick learner. Often he will assist local craftsmen with various tasks around the property.